There are many instances of permanent changes to an opera made to accommodate a particular singer. 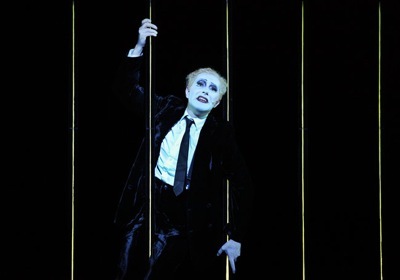 Perhaps the most famous is the line La commedia è finita, originally written for Tonio as a raisonneur's final pronouncement, but ceded for all time to Canio when Caruso demanded it for his New York performances. It is, however, rare for two significant alterations to appear on opening night of one production and linger for good and all. Just before the premiere of Die Dreigroschenoper, the star of the show demanded of its creators that his character of Macheath receive more of a grandiose introduction. The Ballad of Mackie Messer and the role of the streetsinger were born. Now Brecht's own Berliner Ensemble is touring the world with its new production and stopped in at the Brooklyn Academy of Music for a five days' run. Apparently it is the staging that gives this version its mojo, for certainly the press and publicity people wish to speak of the staging virtually exclusively, as if the musical performance were irrelevant. We will indeed speak of the staging a little, but I believe strongly that a music critic's role is to discuss the music, no matter where that discussion may lead. Sadly, this performance was very poor. The instrumental ensemble was undisciplined and wayward throughout, seeming to feel hesitant as they approximated the notes and rhythms from the printed page. There was no sense of tension, no undercurrent of the phlegmatic leading to the nihilistic, no hint of the unique quality of that signature magic of Weill. Would that I were Jedediah Leland writing his review of Susan Alexander Kane so that I could state "her singing, happily, is no concern of this department", but, alas it is our major concern. Unfortunately, even the technical apparatus worked to the ensemble's disadvantage: all of the singers were amplified so that any sense of the human voice was subsumed under a sea of reverberation and feedback. It was hard to judge the competency of the individual artists and so only generalities will suffice to explain this maelstrom of sound. Seeraeuberjenny (Pirate Jenny) is actually not by Weill at all, but rather a song that Brecht had written a few years earlier. Weill arranged it for its inclusion in the show, where it was scheduled to be performed by Polly Peachum. However, Lotte Lenya was cast as the prostitute Jenny and commandeered the showstopper as befitting one who escapes on the ship with eight sails (mysteriously translated into English for all time as "the black freighter"). In this production, Polly had her turn with the piece (either is acceptable, depending on casting) and what happened to her is emblematic of this evening. Once she finished her big number, a showstopper in 99 out of 100 performances by other casts, she was greeted with silence. The conductor clearly was waiting for the applause and so, after about 30 seconds of awkwardness, the boys of the chorus started to clap, engendering a small smattering of response from the crowd. Stefanie Stappenbeck did sing this classic number in a new and interesting way, emphasizing the sweetness of Polly even as she describes the murdering of the citizens of the town and only turning her voice cold when uttering the word "alle" when asked who should be executed (the great ones from Lenya to Lemper do just the opposite, so that the innocence of the one spoken word sends chills when articulated). Stirringly perverse ditties like the "Cannon Song" were turned to a vocal type of steak tartare by our Macheath Stefan Kurt and the Tiger Brown of Axel Werner: no excitement, no glory, no dubious morality, no villainy. As for the staging, it was anything but Brechtian. Attempting to see both sides of this argument, I was disappointed that the ensemble that has been performing this classic since 1930 did not offer an "authentic" version, but imagine if you had to perform it over and over and over, perhaps you too might opt for some variety. So Robert Wilson's staging and lighting and sets were interesting in and of themselve. Lights were pinwheels for the opening parade, bars for the scenes at Peachum's bank. All of the character actors were done up in whiteface, however Macheath being dressed in ladies' undergarments for a good part of the middle simply seemed gratuitous. In hair and makeup he was meant to stand out from the others, looking quite a bit like Francis X. Bushman, which gave some historical aroma to the piece as a whole. Everyone else was post-Godot stock characters, who seemed to be a bit influenced by the current trend toward zombies in our pop culture.